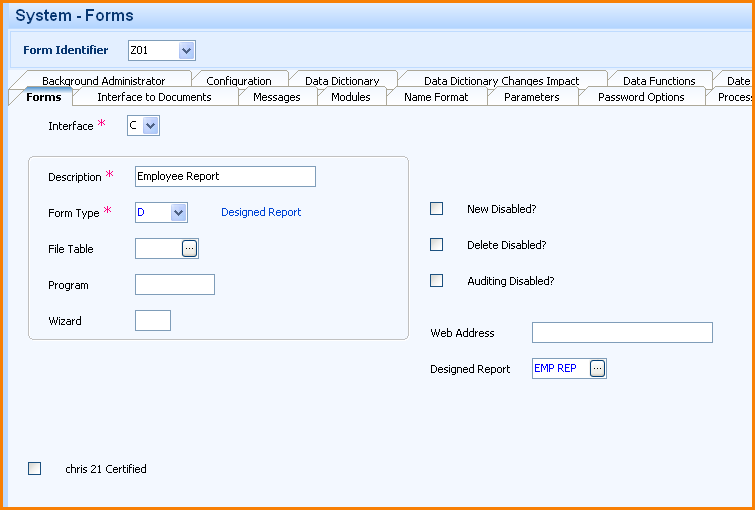 Usually you will access your Chris21 reports directly from the report designer. This is fine for reports that you only want to run yourself but what if that report is useful for all the Chris21 users in your team? Rather than each user having to search for the report in the report designer, you could attach this report to a menu so that it is accessible to all users who have been granted security access. This is firstly a matter of convenience – consider how difficult it can sometimes be to find a report from the hundreds that could reside in the report designer. And secondly, it reduces the risk of a user running the wrong report. This is also a great idea if you want to group a number of Chris21 reports onto a sub-menu, for example, Learning and Development reports. Note: These types of changes will usually be done by your Chris21 administrator. If you don’t have full security access to your system you will need some assistance from your administrator. Set the report permissions. Make sure the permissions on your report are set to Allow modifications by non-owners. This is necessary so that other users can make changes to report selections, such as date ranges. Create a new form. Create a new form using the Forms (SCN) form. Name your form beginning with the letter Z. This naming convention will ensure that your form will not be lost after future Chris21 upgrades. Associate your report with the new form as shown below: The areas to note in the screenshot above are the Form Type field which must be set to D for Designed Report and the Designed Report field which is the name of your report in the report designer. Grant security access to the new form. You now need to setup the security access to this form, just like you would for any other form. Go to the Privileges (ATT) form and add Z01 to the relevant security profile. All users who have been assigned this security profile will now have access to the new form Z01. Add the new form to the menu. Even though users now have access to the form, they still won’t see the form until it is added to their Chris21 menu. To do this, open the menu designer and the open the relevant menu. You may be using a copy of the master menu for all users or you may have specific menus for the various groups of Chris21 users in your organisation. See my blog How to Use the Chris21 Menu Designer for more information. After following these steps all users in your group will now have access to your Chris21 report. Better still, they will be able to access the report and change any selections directly from the Chris21 menu without having to open the report designer and search for the report. Try this functionality for a better way to share your Chris21 reports with your team. Is there any way we can add report designer reports to a batch? We have 9 finance reports to run and it’s become so time consuming, we need to find a better way.